Turner Klingenmeier made a 25-yard field goal late in the fourth quarter to give Desert Pines a 44-41 victory over Centennial. It’s not often a kicker has his name chanted after a win. Desert Pines senior Turner Klingenmeier proved to be an exception Friday night. 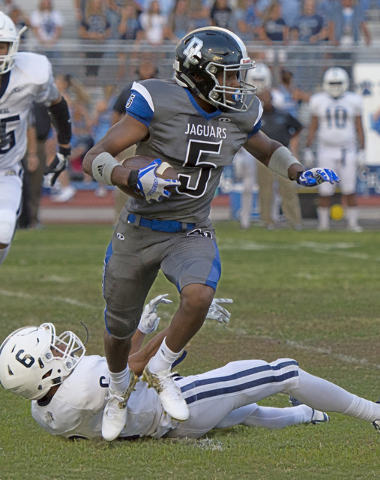 With the Class 3A Jaguars tied with Class 4A Centennial late in the fourth quarter, Klingenmeier made a 25-yard field goal to put Desert Pines ahead for good. He was lifted by a teammate right after the kick, then mobbed by the whole team following a 44-41 victory in the season opener for both teams. Except it wasn’t business as usual. Desert Pines isn’t usually a kicking team. Klingenmeier’s leg was also active throughout the game on extra points, as the Jaguars scored six touchdowns. 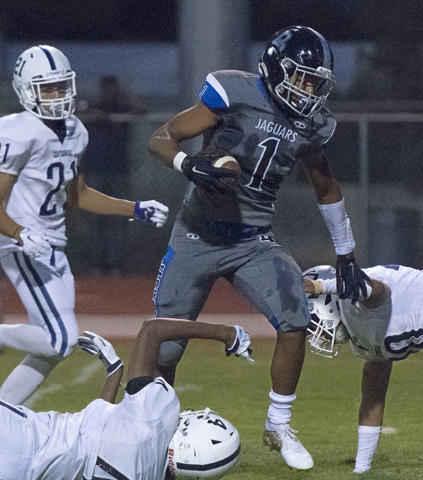 Desert Pines scored or reached the red zone on seven of its first eight possessions and built a 21-7 lead after the first quarter, but Centennial wouldn’t go away. Bulldogs quarterback Jamaal Evans, a Utah State commit, turned the game into a shootout with 405 total yards and five touchdowns through the air and on the ground. His 3-yard rushing touchdown with almost 5½ minutes to play tied the game at 41, but Desert Pines responded. Quarterback Marckell Grayson, who had 216 yards passing and 40 yards rushing, converted on a sneak on fourth-and-1 to keep a Jaguars drive alive. He had another rush to set up the game-winning field goal but was injured on the play. 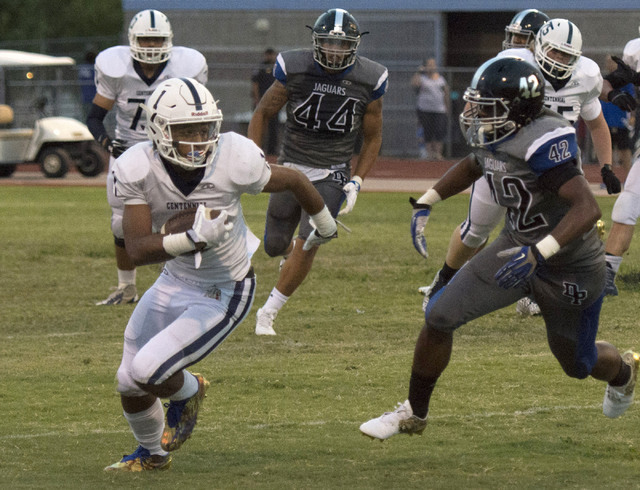 Rodriguez said Grayson was beingchecked out after the game, but the quarterback played a huge part in Desert Pines opening the season with a victory over a 4A school for the second consecutive year. 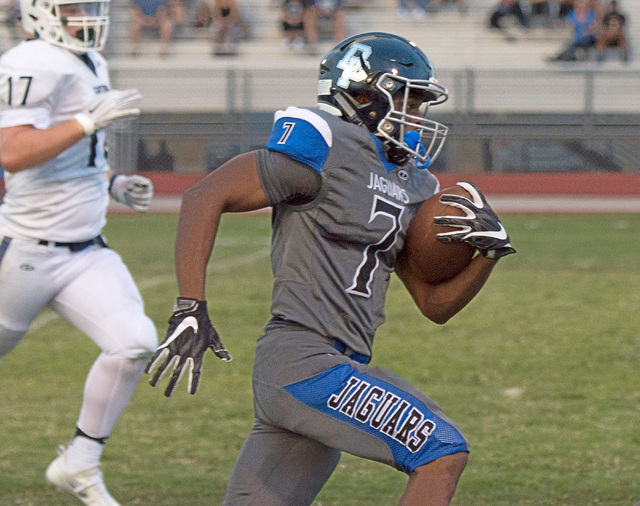 The Jaguars defeated Arbor View 50-14 in their first game last season. Rodriguez also had high praise for senior running back Isaiah Morris, who finished with 15 carries for 208 yards rushing. He had touchdown runs of 59 and 52 yards in the first quarter.